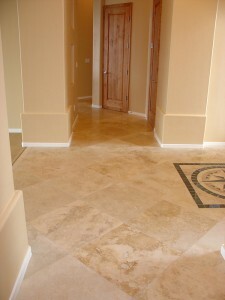 Travertine is a very popular building material in Florida. Its rustic appearance and durability makes it a favorite choice for interior design projects. Travertine is used as a flooring tile product, as a natural stone window sill, and also as a floor transition saddle. The latter can be difficult to obtain at wholesale prices, but construction contractors in Jacksonville will find exactly what they need at Stonexchange. Stonexchange is a Miami-based importer of top-quality natural stone building materials. We operate our own manufacturing plants overseas, and we offer our commercial clients the lowest possible wholesale price on premium travertine thresholds, sills, and flooring tiles. The main advantage of ordering direct from us is year-round availability of our stone products. Installers in Jacksonville needing full-crate orders of travertine thresholds can obtain their product in less than one week, and the material can be shipped right to the job site. Travertine is often thought of as a porous, brittle stone by those who take only a casual look at it. This material is formed when water laden with minerals percolates through a soft layer of rock. The result is a limestone deposit that is streaked with contaminants. Cave stalactites are a perfect example of how water percolation actually forms new rock. Travertine is a very sturdy material, and as long as it is protected against moisture intrusion the rock will retain its natural color for decades. When extracted from quarries, travertine is thinned down into sheets that are then fabricated into thresholds pieces, flooring or wall tiles, and window sills. The material is graded according to the amount of wear and tear it can handle without scuffing or scratching. Travertine thresholds are made from high-quality stone. These transition saddles are meant to provide a smooth separation between two different floor surfaces with no tripping hazard. Thresholds also act as a water barrier. 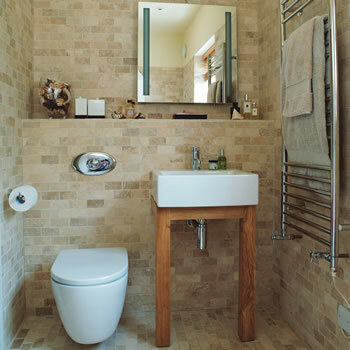 This is why they are often installed in a bathroom doorway that has a natural stone floor. The highest grade travertine has been given a thorough coating of specialized sealant. This prevents any contaminated moisture from discoloring the stone. It also means that travertine can be safely used in bathroom doorways where standing water or high humidity are often encountered. When it is honed, filled, and sealed, travertine is very strong and can stand up to heavy foot traffic. This makes it a popular choice for thresholds, especially if the material is also being used for other room accents such as window sills. Travertine varies in color but the most common shade used for interior design is cream/beige. Cream or ivory travertine works very well with other neutral shades used for furnishings or wall accents. It stands out nicely when set against light-colored walls and floors. When used to separate a very dark or very light shade of tile floor from a complementary shade of carpet, a travertine threshold becomes a visual conversation piece. For constructors and installers in Jacksonville, FL, Stonexchange is ideally located. Our company maintains a large inventory of travertine at our Miami warehouse and distribution center. We price our product according to the cost of fabrication and overseas shipping. Because we import all of our natural stone products in huge quantities, we can offer our clients substantial discounts when our natural stone materials are purchased in bulk. Our travertine thresholds are fabricated in standard 36-inch lengths. They are 2-inch width and are constructed with a double-bevel appearance, meaning that both of the long sides are given a 1/4-inch angled cut. These bevels are then smoothed, the entire piece of stone is honed or polished, and the individual thresholds are packed into containers for transatlantic shipment. Although the standard thickness for a floor saddle is 1/2-inch, we can fill a custom order for slightly thicker pieces. In some regions of the country, common building practices involve the use of thicker or longer saddles because of the prevailing tendency toward wider door entrances. Stonexchange will take a custom order and give the client an accurate delivery date even if the pieces must be specially fabricated overseas. There is no extra cost for this service, which may involve a lead time of up to eight weeks. Stonexchange ships directly to the customer address. For construction companies and installers working in the Jacksonville area, this means rapid shipment from our distribution center in Miami. We use overland freight companies and have negotiated favorable rates with them in order to save our clients money. Our travertine thresholds are shipped in quantities of 200 pieces that have been packed into extremely strong shipping crates. The crates are easily loaded and unloaded from a delivery van using a lift truck equipped with forks or clamps. Stonexchange will deliver to any commercial address including construction sites and storage facilities. Up to 10 percent breakage can be expected during shipment of fragile stone products. However, our company works very hard to reduce damage during transit of stone materials. We carefully pack our transition saddles with cushioning foam, wood splints, and polyurethane film. Our goal is to virtually eliminate any possibility of scratched product during shipment and to minimize shifting of product while the crate is in transit. A large development project such as a condominium complex or hotel renovation calls for hundreds if not thousands of transition saddles. Installers who bid on these contracts need to know where they can find a reliable supply of top-quality stone material at any time of the year. Flooring product merchants may carry a small inventory of thresholds made from travertine or marble, but these retailers usually sell only to individual consumers. Stonexchange provides an alternative to high-cost retail prices on stone products. We deal directly with large flooring companies, home improvement centers, and local dealers throughout the state of Florida. Subcontractors in Jacksonville will often look to an area dealer for the procuring of thresholds, sills, and floor tiles. If the merchant does business with a direct importer such as Stonexchange, product can be delivered in bulk within just a few business days, and the cost savings are quite significant. Our company does not purchase product from a middle-level reseller. We are the manufacturer, importer, and distributor of our natural stone materials including our fabulous travertine thresholds. The end result is lower per-piece cost, making it easier for the subcontractor or installer to place a confident bid on the job contract. The mild climate of Florida means that there is no ramping down of construction projects during the winter. Natural stone product must be available at all times of the year. Unfortunately, many resellers of travertine, marble, and other natural stone products experience higher costs during the winter because the demand for material is lower. Stonexchange solves this problem for contractors looking to purchase material during the winter. Because we are the manufacturer as well as the importer, we can promise truly wholesale pricing on our line of products throughout the calendar year. We do not experience slowdowns in our supply line because we import huge quantities of finished product on a constant basis. Dealers located in Jacksonville have the opportunity to offer fantastically low pricing to installers and subcontractors by purchasing directly from our company. Commercial floor product installers will likely reorder from a company that can promise rapid delivery in December as well as in June. Everyone wants to save money and pass the savings on to the end-user because the result is a substantial increase in repeat business. In the end, everyone wins when the product is supplied by a direct importer and distributor. Stonexchange offers wholesale pricing on marble, granite, and engineered stone materials in addition to our line of travertine products. Most interior designs call for the use of several different natural stone materials, and we can fill a mix-and-match order with ease. Our entire line of products has been carefully chosen to match or replace existing stone materials. Our various products are fabricated from material taken from the same geological formations. Our travertine thresholds will perfectly match our window sills made from the same material because both were extracted from the same deposits located overseas. We maintain a stringent quality control operation to ensure that the color, patterning, and style of every natural stone product we manufacture and sell is a perfect match. Remember that Stonexchange will fabricate custom-size thresholds upon request. Although installers are often experienced in the cutting and shaping of larger travertine slabs, this operation takes time and runs up the labor costs. It is actually less expensive to have our fabricators take a custom order and manufacture the product in bulk quantities. Constructors and installers in Jacksonville have a friend in the natural stone product industry. Stonexchange is in operation to offer the lowest price on the highest quality thresholds, sills, and floor tiles. Contact us today and get all the details on pricing, delivery schedules, and product availability. We are in business to save you money on your future installation projects.